Artist rendering of Chang'e-3 lander and rover. Photo: China Academy of Space Technology. BEIJING (PTI): China has successfully sent an unmanned lunar probe with a robotic rover to soft land on the Moon and explore its surface, a major milestone for the Communist giant's maiden attempt to land on an extra- terrestrial celestial body. The probe Chang'e-3 was on Sunday launched into orbit aboard an enhanced 56.4 meter high Long March-3B carrier rocket from the Xichang Satellite Launch Centre. Official broadcaster CCTV showed in live footage of the textbook launch. 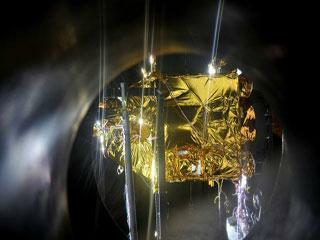 The probe successfully entered the required orbit, CCTV said. The mission was the 25th launch of the Long March-3B, which is the most powerful launch vehicle in the Long March fleet. 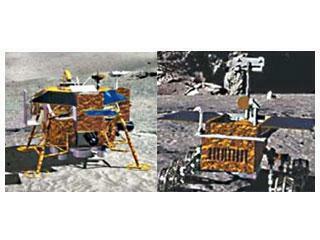 Chang'e-3 comprises a lander and a Moon rover called "Yutu" (Jade Rabbit). In Chinese folklore, a white rabbit was the pet of Moon goddess Chang'e. The lunar probe will land on the Moon in mid-December if everything goes according to plan, official media reported. Tasks for Yutu include surveying the Moon's geological structure and surface substances, while looking for natural resources. So far, only the US and the former Soviet Union have soft-landed on the Moon. After entering lunar orbit, Chang'e-3 will go through six stages of deceleration to descend from 15-km above to the lunar surface. It is the first time China is attempting soft landing on a celestial body and also the first time any lunar soft landing is being carried out since 1976, when other countries suspended exploration, said Li Benzheng, deputy commander in chief of the lunar exploration programme. 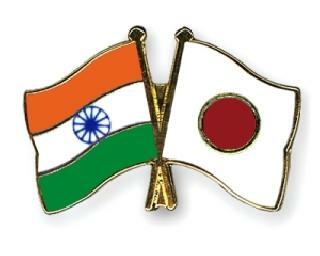 India's Chandrayaan-1, which was credited to have discovered water in the lunar surface made a hard landing on the Moon. Using data collected by Chandrayaan mission, NASA scientists have detected magmatic water locked under the surface of the Moon.